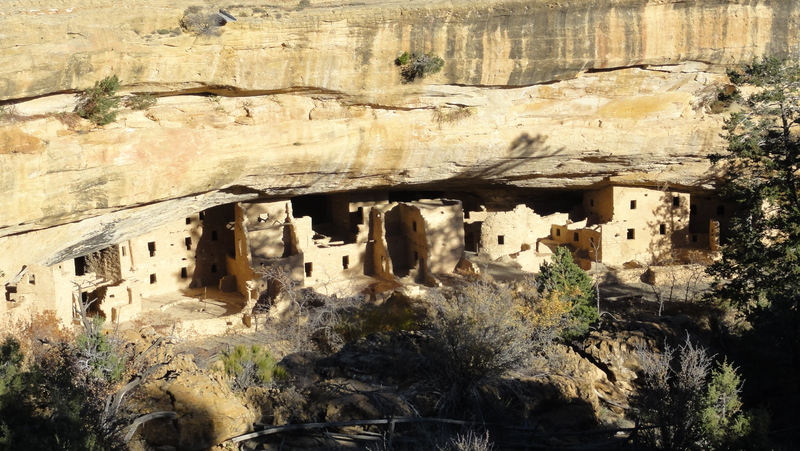 Question: Why did the Puebloans choose to build dwellings inside the crevasses of the cliffs nearly 1000 years ago? We drove past the town of Cortez in late afternoon and see a mountain that rose from the flat plains. The white cliff near the top looked like a hat. 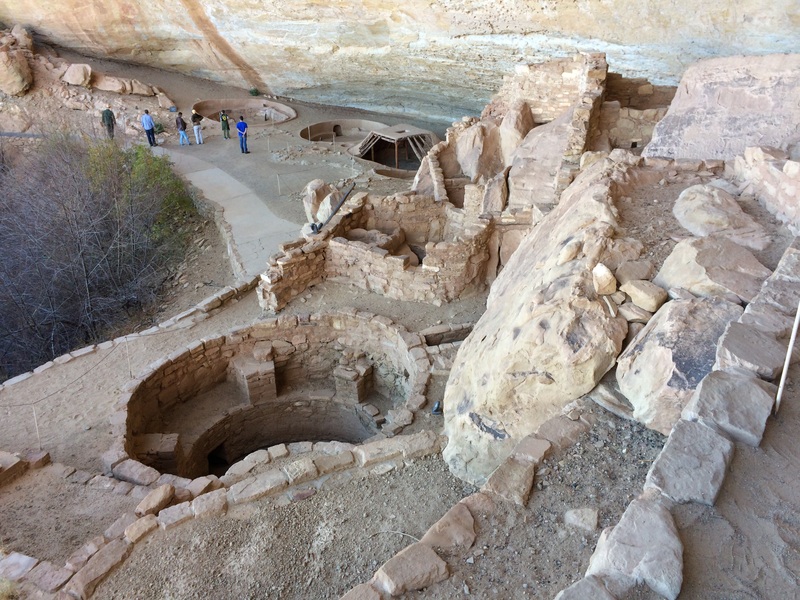 We stopped at the very modern looking Mesa Verde National Park visitor center to accomplish a very critical task – buy the tour ticket for the next day. Because of safety and renovation, the only tour offered was Balcony House. We purchased the very reasonably priced $4 tickets. The drive up the mountain was longer than expected – more than 50 minutes. We arrived just in time to tour the Chapin Mesa Archeological Museum that showed the history of the Pueblo people and their time at Mesa Verde, and watched the 25 minute film. The nearby Spruce Tree House was closed due to potential of falling rocks but we were able to view it from a distance. 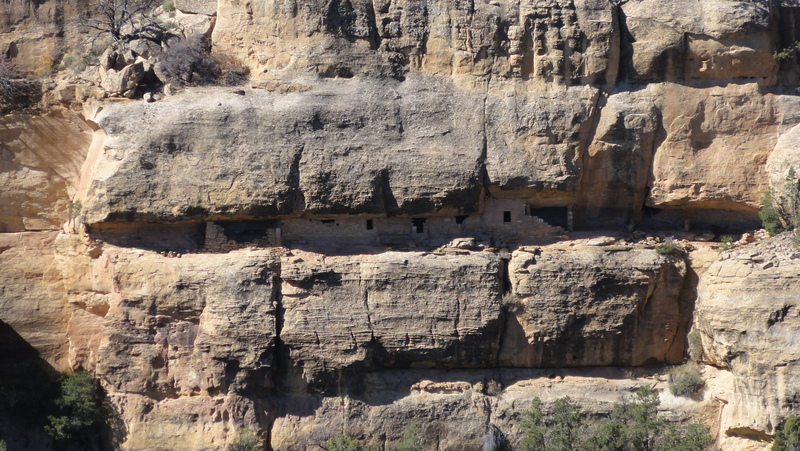 This gave us the first live view of a cliff dwelling. I was impressed. The Puebloans built this 900 years ago! 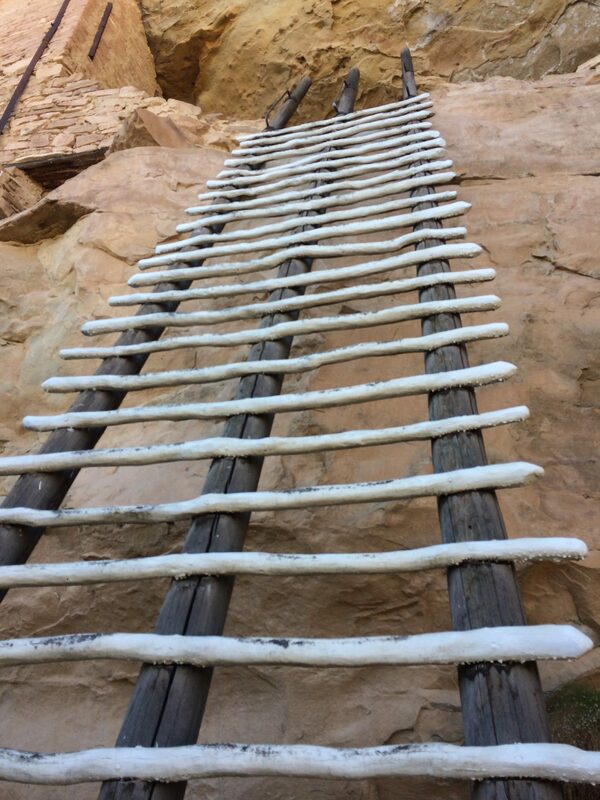 Mesa Verde National Park is all about history and the amazing structures the ancient Puebloans built. We knew this park is more about history than scenery, but we didn’t know exactly what to expect. The first view of Spruce Tree House with its beige color is unlike any picture I’ve seen. It looked amazing and unnatural at the same time. I kept thinking why people of 1000 years ago would spend the energy to build such structures right into the cliff. I wondered how they get to and from the dwellings. The park has two main branches. Wetherill Mesa Road is open from May through September so that is not an option during our October visit. We went down the Chapin Mesa branch and took a short hike at Park Point Overlook, the highest point in the park at 8572 feet for a nice view of the valley below. Next up for us was the Mesa Top Loop to look at 700 years of Pueblo history, from 650 AD to 1350 AD . 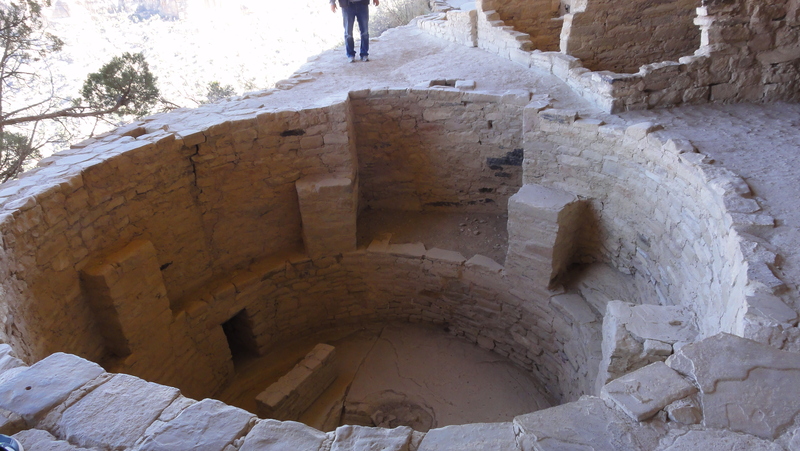 The Puebloans built pit houses in 650 AD. A pit House was basically a five foot pit in the ground with branches and thatch roof. As time progressed, the pit got fancier with more rooms. The main room was for ceremonies with specific ventilation to help with airflow to feed the fire in the middle of the room. I wondered how they keep the flame from torching the thatch roof. We stopped at all the sights and encountered very few other visitors. This was the benefit of visiting during the off season. It was like walking through 600 years of history in three hours. After the terrific Mesa Top Loop, we came to the highlight of the day – Balcony House tour. The tour took us down to an actual cliff dwelling. The ranger took us to Balcony House via a short switchback trail that descended to the actual house. These trails were not obvious when the house is viewed from a distance. The mystery of how the Puebloans accessed the cliff houses from the plateau above is solved – a simple switchback trail. They did not have to climb the rock cliffs. The house was made of brick like building blocks. The Puebloans chiseled the cliff rock to form brick sized blocks, used mortar made of locally available sand, and built the walls for living units. Some of the walls went from the bottom to the top of the cliff opening. These dwellings had individual rooms in a multi-story city apartment like structure. There was a surprising amount of space in these cliff openings. A modern living room can easily fit in one of these spaces. We got to the house with an easy walk down, but to get back up required more work. Two ladders waited for us. These were not for the faint of heart. As I climbed up the ladder, I told myself to just look up and take one step at a time. It was a good thing the ladders were anchored and steady. The people born into this environment and climbed ladders all the time would feel at home, but what happened when they got old and frail? That’s probably why the life expectancy was probably in the 30s. I tried to imagine what life was like in these dwellings. How hard did they have to work to survive? What was their social structure like? Did they have the same relationship issues we have today? How did they cook? What did they eat? When I sat in Balcony House, I finally realized why the Puebloans chose to build the houses in the cliff. The opening in the cliff provided natural shelter from sun, rain, and wind. They only had to build the wall in two or three sides, not the five sides normally required. They built it here because there were good sized openings in the cliff to allow house sized space for living. I said to my wife: Can you imagine chasing after a 2 year old to stop him from getting too close to the edge? The ranger told us the Puebloans farmed the plateau land but chose to build their homes in the cavity of the cliffs just below the plateau. It must have been very difficult to do given the technology of 1000 years ago. 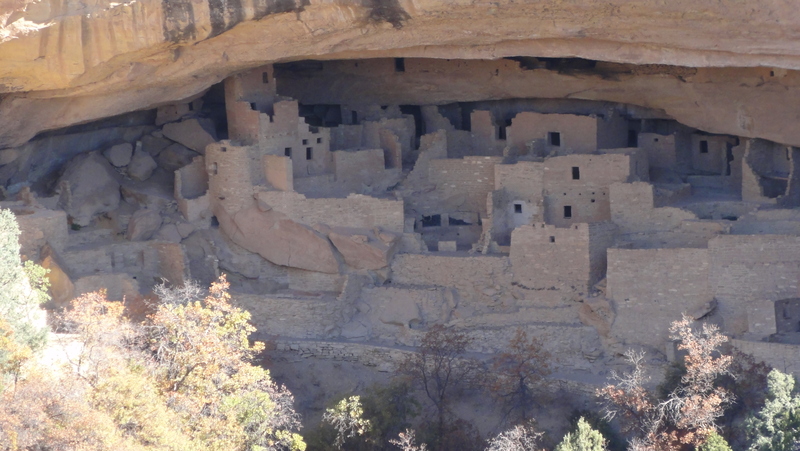 We don’t know why the Puebloans left the cliff dwellings and the area around 1350 AD, after living in the dwellings for a couple of hundred years. I thought the hard part was building them. There must have been a disaster of some sort to force them to leave. After the excellent Balcony House tour, we continued to the sights on the Cliff Palace Loop with views of multiple cliff dwellings. All of them are different yet all are amazing. We did a self guided tour of Step House, which was a small dwelling on a nice trail that went from the plateau down to Step House and wind back up in a loop. This was a small house with a nicely preserved pit house. The Cliff Place looks very grand from a distance. It’s the largest dwelling. I was disappointed it was not open during the time we were there due to potential rockfall. Cliff Palace would have been a sight to see. Think outside of the box. Take advantage of the environment. 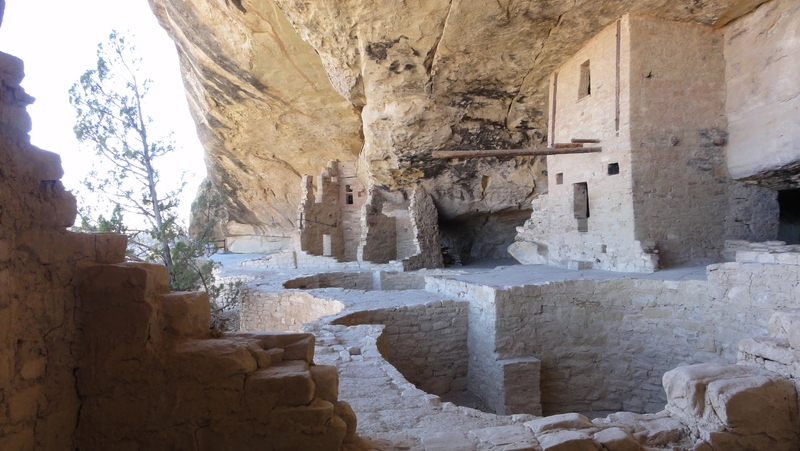 Just like the Puebloans took advantage of the openings in the cliff to build shelter. Mesa Verde is unique. This is a National Park based on history, unlike any other National Park. The sights are amazing and hard to contemplate. The National Park Service did a good job presenting the history of the Puebloans and the cliff dwellings. I wish I could have visited more than dwellings but the threat of falling rock closed some of the tours. Have you visited Mesa Verde National Park? Leave a comment below on your experience. Tour of one or more of the cliff houses. Mesa Top Loop for self guided history. Balcony House Loop for great views of several cliff dwellings. Chapen Mesa Archaeological Museum and Spurce Tree House. Get to the visitor center at the bottom of the hill the day before if you can and get tour tickets for the next day. Get at least one but two tours if you can, depending on the current situation. Visit Mesa Top Loop in between the tours. 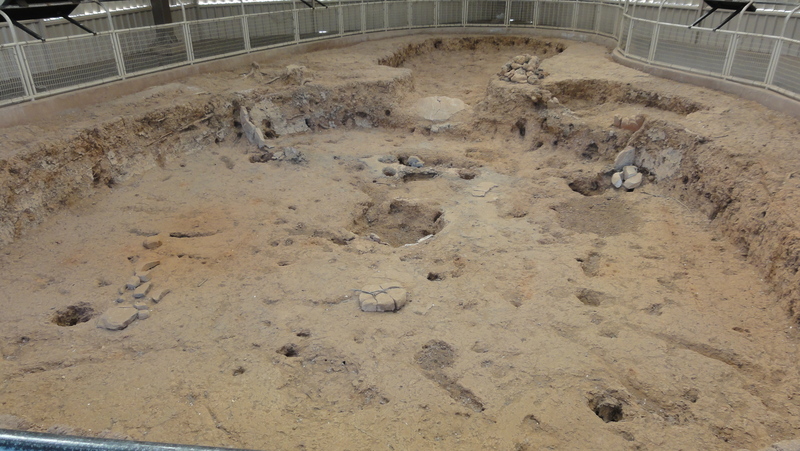 Visit Chapen Mesa Archaeological Museum and Spruce Tree House in between tours. Drive to and hike Step House Loop if time allows. Get the tour tickets. Tour(s) are the highlight and it’s very reasonably priced. You can buy tickets up to two days in advance for most tours. The drive from the visitor center at the base of the mountain to the top, where most sights are, will take a good 45 minutes. It’s 23 miles of winding road. Plan for it. Summer provides the most choices for tours. The altitude makes the summer generally cool. The town of Cortez is the gateway to Mesa Verde, with good services. La Casita is an excellent Mexican restaurant in Cortez. Check them out. The park can be visited in one long day with a couple of tours. To explore more deeply, plan on 1 1/2 days. Visitors: 613,788 in 2017, ranked 33rd. Record attendance in 2017. Peak Month in 2017: July with 119,918 visitors. Low Month in 2017: January with 5,601 visitors. Entrance fee: $20 per vehicle in peak season, $15 off peak or $10 per person with no car in peak season, $7 off peak. Tours cost additional.